"An entire head of cauliflower roasted with butter, garlic, and herbs. 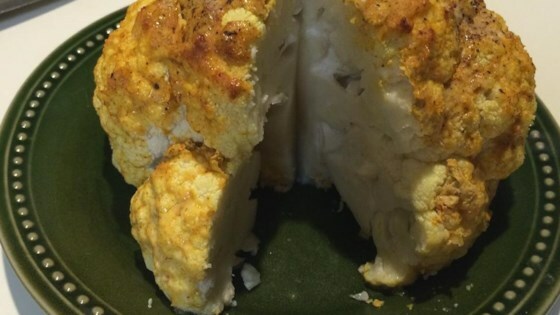 Can convert cauliflower-avoiders into cauliflower-lovers! A beautiful and delicious way to serve cauliflower. Never any leftovers. Can substitute low-fat butter for butter." Mix butter, dill, garlic, lemon zest, cumin, salt, and ground black pepper in a bowl. Cut cauliflower stem flush with the rest of the head so it can stay upright in a casserole dish. Spread butter mixture evenly over the top and sides of cauliflower, place in a casserole dish, and cover with foil. Roast in the preheated oven until tender and cooked through, about 1 1/4 hours. Transfer to a platter and spoon any liquid in the casserole dish over the cauliflower. Cauliflower cut into steaks and roasted in the oven until golden and tender. Made it tonight, and it's a great suggestion that's really easy to vary. I like this dish. I've never used cumin, lemon zest, and dill together. I liked the depth of flavor it gave to this vegetable.